Keep your beverages fresh the 2 Quart Round Pitcher. It features a hinged flip-top tab that lifts easily and stays open and out of the way when pouring. The clear base allows you to see when it’s time to refill and a comfort-grip handle aids in controlled and natural pouring. 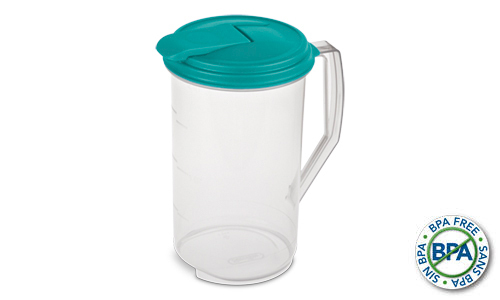 The graduated measure marks make it easy to mix drinks like, lemonade or iced tea, right in the pitcher. Its snap tight lid makes for a secure seal, keeping your drinks fresh and ready to serve. 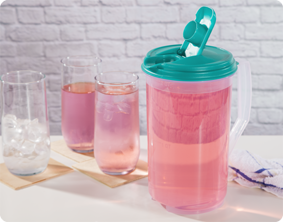 As with all Sterilite drinkware products, the pitchers are easy to clean and are freezer and dishwasher safe, as well as BPA-free and phthalate-free. The overall dimensions of this item are 7 1/8" L x 5 3/8" W x 8 7/8" H.
Overall Assembled Size: 7 1/8" x 5 3/8" x 8 7/8"
2 Quart Round Pitcher is rated 4.5 out of 5 by 2. Rated 5 out of 5 by sparkle40175 from this pitcher is great i really like this pitcher. easy to carry, easy to mix in, easy to pour & easy to clean. perfect size for most of my beverages. i like the type of tab it has on top. Rated 4 out of 5 by Sparkle from I love this pitcher! 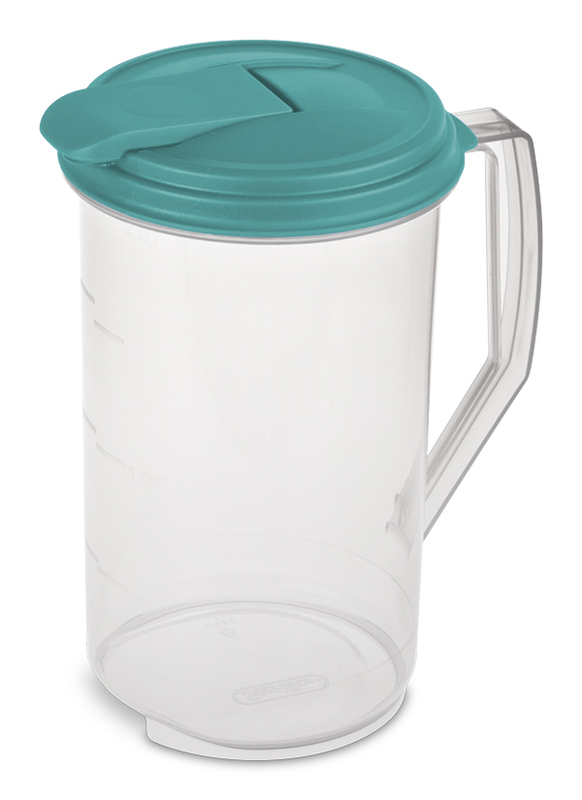 This pitcher looks great, is easy to hold, and the lid is easy to remove and replace. If the lid is fully placed on, and the spout tab is snapped shut, I can even shake it with no splatters or leaking. Both the lid and base are also very easy to wash.